Mylpg.in - Are you searching to get Link status of your LPG Subsidy? Here is the tutorial you can check is your LPG Subsidy account is linked or not with government subsidy account. Since Modi Government introduced direct subsidy scheme for LPG subscriber, some people didn't received LPG Subsidy in their account. 1. Do confirm one more time in your LPG Gas Distributor Center, Did they added your account and linked with LPG subsidy or not? If they done it, do confirm your bank account no there. 2. Go to your Bank where you have submitted your LPG Subsidy form, Do check if Bank has linked your account with subsidy with proper information or not. If No, do correct it, If Yes, Follow step 3. (if you don't have bank account then you can open free bank account with PM Jan Dhan Yojana. 3. Check your Lpg subsidy link status at this link now with entering your LPG id. Do Note that LPG Subsidy scheme is only available at Indine, HP gas and Bharat gas company only. 4. If your account is linked in Bank + LPG distributor Center, then just Book new LPG cylinder from LPG Distributor center. After Booking for new LPG Cylinder you will receive SMS from your LPG Company. 5. After Few days, you will receive Subsidy amount in your Bank Account (mostly within 1-2 days of booking LPG gas cylinder). Just before receiving gas cylinder, you will get receipt amount via sms and you will receive gas cylinder within few days. 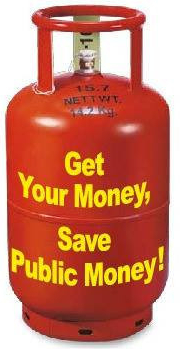 I didn't Received Money of LPG Subsidy in my Bank account, What to do? Just check your subsidy is linked or not from LPG distributor and bank account, if it is linked from both end, you will receive subsidy amount soon.If you had joined the previous PAHAL (DBTL) scheme and had got the advance/subsidy in your Bank Account then - You don't have to do anything again. If you are not joined to PAHAL Yojana for LPG Subsidy scheme, just fill the application form now and join. Update :- As of now we are writing this, Till date, almost 10cr subscribers has got LPG subsidy and Rs.8552.86cr are given as LPG Subsidy.